Can also do multiple smaller set ups. This set INCLUDES 3 separate Battery Powered engines (Thomas, James & Salty) that travel through your setup, pulling cars under their own power. Very fun, and great for a holiday set up that runs on its own. We had fun unloading cars with Cranky, and filling from Water Tower, etc on a spur while another powered train travelled through the connected loop. This is a great set for young toddlers who want to push the unpowered, standard train pieces, but you can then let the powered trains go on their own, with nobody playing on it--or for older kids to use both. Can't miss with this set. We considered keeping it as it's all high quality and really charming and will last for a long time. The type of thing that can be passed down. 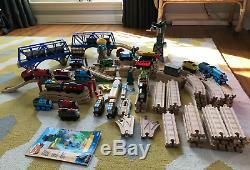 Set Includes everything pictured, including. Battery powered Talking Gordon, Musical Caboose, Lighted Steamworks Car. A total of 28 separate cars. Large 2 structure trestle bridge with 2 ramp tracks. 3 over passes with 4 ramp tracks. 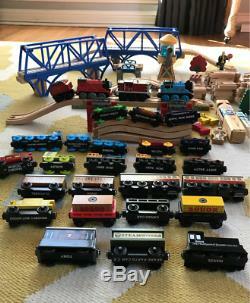 The item "Beautiful Thomas The Train & Friends Wood Track Set 3 POWERED Tank Engine Cranky" is in sale since Tuesday, December 4, 2018. This item is in the category "Toys & Hobbies\TV & Movie Character Toys". 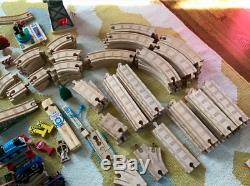 The seller is "whatsracheer" and is located in Los Angeles, California. This item can be shipped to United States, Canada, United Kingdom, Denmark, Romania, Slovakia, Bulgaria, Czech republic, Finland, Hungary, Latvia, Lithuania, Malta, Estonia, Australia, Greece, Portugal, Cyprus, Slovenia, Japan, China, Sweden, South Korea, Indonesia, Taiwan, Thailand, Belgium, France, Hong Kong, Ireland, Netherlands, Poland, Spain, Italy, Germany, Austria, Bahamas, Israel, Mexico, New Zealand, Philippines, Singapore, Switzerland, Norway, Saudi arabia, Ukraine, United arab emirates, Qatar, Kuwait, Bahrain, Croatia, Malaysia, Chile, Colombia, Costa rica, Dominican republic, Panama, Trinidad and tobago, Guatemala, El salvador, Honduras, Jamaica, Antigua and barbuda, Aruba, Belize, Dominica, Grenada, Saint kitts and nevis, Saint lucia, Montserrat, Turks and caicos islands, Barbados, Bangladesh, Bermuda, Brunei darussalam, Bolivia, Egypt, French guiana, Guernsey, Gibraltar, Guadeloupe, Iceland, Jersey, Jordan, Cambodia, Cayman islands, Liechtenstein, Sri lanka, Luxembourg, Monaco, Macao, Martinique, Maldives, Nicaragua, Oman, Pakistan, Paraguay, Reunion.